This entry was posted on Thursday, April 24th, 2008 at 9:37 am	and is filed under Uncategorized. You can follow any responses to this entry through the RSS 2.0 feed. You can leave a response, or trackback from your own site. 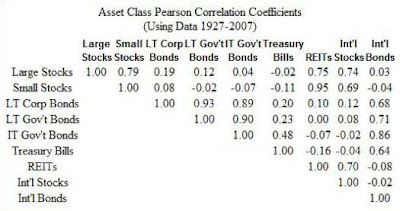 I am interested in correlation coefficients for various asset classes and am keen to find out from exactly which source you found the Pearson correlation coefficient matrix (data 1927 – 2007). Is this table published in a journal or book that is easily accessible? The matrix of Pearson coefficients was computed by my elf (oops, I mean myself) using a short Java program to apply Pearson’s formula to the annual historical (1927-2007) total return data for each of the asset classes. This particular table was prepared exclusively for Dr. Kris’ Stock Market Cookbook and appears nowhere else. The historical total return data are from Ibbotson & Associates and Dimensional Fund Advisors. Thanks a lot for getting back to me! That is very helpful. Since you showed interest in the MPT discussion, I wanted to update you personally on the tables listed in Parts II-IV. Prof. Pat informed me that he input one piece of data incorrectly. He revised the tables and discussions pertinent to them. The April 22-24 blogs have modified to reflect these changes.